I wanted a nice dinner after cleaning my carpets all day so I put this together in my slow cooker. I used sirloin tips, and huge chunks of mushroom. (Love them). I also added chopped onions and very generous garlic. Two bay Leaf, and 1 T of brown sugar which was a great tip from previous reviews. I substituted 1/2C Brandy for the wine and used 3/4C beef broth with the tomato sauce, it was awesome. 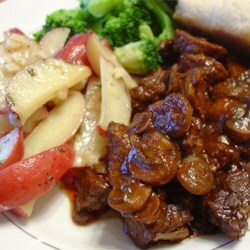 Whenever I cook stews or something similar to this in the slow cooker, too much liquid can be a problem. My secret is adding 1 good Tablespoon of Tapioca about an hour before it's done. Leave the cover off and let it thicken. It does not cloud the sauce and keeps it very smooth. It keeps it more of a sauce than a gravy.You can always put the lid back on to perfect the amount of thickening you want. I served it with Garden Harvest Rice pilaf and salad. Thanks so much for the recipe.